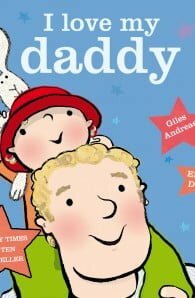 A board book edition of this bestselling story about the special relationship between father and child. Giles is the author of many best-selling and award-winning children’s books including Giraffes Can’t Dance, Rumble in the Jungle, Pants and Captain Flinn and the Pirate Dinosaurs. Giles is also the creator of the stick-man cartoon poet, Purple Ronnie, and of the playful artist/philosopher, Edward Monkton. Giles lives near Oxford with his wife and 4 young children, and has a studio overlooking the sea in Cornwall, where he writes and draws many of his best-known creations. What makes Giles most happy is playing on the beach with his family in the sunshine. Emma Dodd was brought up in Guildford, Surrey, in a family of artists. She studied Graphic Design and Illustration at Central Saint Martin's School of Art and has worked in advertising, editorial and book illustration. Emma has written and illustrated many books for children, including I Love Bugs! ; I Love Beasts! ; I Don't Want a Posh Dog and I Don't Want a Cool Cat for Orchard. She lives in Surrey with her husband and two children and their Jack Russell terrier, Bart.